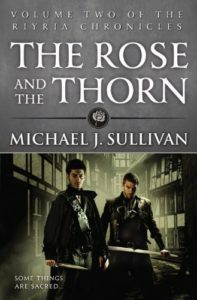 After I reviewed The Crown Tower, I immediately started reading The Rose and the Thorn. Based on past experience I’m forcing myself to review each book before I read the next one in the series, otherwise the stories start to blur together and I can’t separate the books enough to review each one individually. The Rose and the Thorn is the second book in the Riyria Chronicles series of standalones. Whereas the first book, The Crown Tower, told the story of how Royce and Hadrian became partners, this book tells the story of how they came to form Riyria and ended up in the arrangement we see them in at the beginning of Theft of Swords. A year after the events of The Crown Tower, Royce and Hadrian are back in Medford and stop by at Gwen’s – only she won’t see them because she’s been beaten up, and she’s trying to protect them from getting themselves killed trying to help her. Of course, this is Royce and Hadrian, and they can take care of themselves. We also get some additional viewpoints at Castle Essendon, the seat of the royal family of Melengar, as a plot against them unfolds. This was a fun story, it was nice to see Royce and Hadrian settle into their element. Plus, we are introduced to early versions of more of the Riyria Revelations cast. I always think of these books as cozy, but there’s actually a fair amount of death and destruction and darkness, exemplified by Royce’s actions. Royce is terrifying, and I don’t know why I think of him as lovable. The last chapter of this book (The Visitor) really frustrated me, though – its only purpose seemed to be to set up Theft of Swords with all the subtlety of a hammer. Foreshadowing is great, but the most fun thing about it is putting things together from what seem like inconsequential details upon first glance. I already thought the references to an unrevealed co-conspirator were fairly obvious, but to tack on a whole chapter laying it all out in the open felt like overkill. And reading this chapter also made me figure out the feeling I have when reading Sullivan’s books that I haven’t been able to articulate in my previous reviews – the dialogue in his books is always a little bit too on-the-nose for his characters to feel completely real. Especially the villains – they often explain their plans concisely and articulately at some point. Despite my complaints, I still really enjoy these books, and I’m hurriedly reviewing this book so that I can get to The Death of Dulgath. I’m particularly excited about that one because it feels like it’ll be more of a standalone adventure and not so much of the origin story that the first two books have been. And after that, I’m also contemplating a reread of the Riyria Revelations.